The following chart shows the performance of the Alamo market in 2011 versus 2010 for the first eight months of the year. The single family market has experienced a slight slowdown in unit sales and a small increase in average marketing time. The median sales price has remained basically unchanged. The attached homes segment the same number of unit sales but a large decrease in the median price. Keep in mind that the sample of attached homes is small and subject to large variations month over month. Real estate markets are local in nature and various neighborhoods can and do perform differently. Please call for more information on the Alamo market. 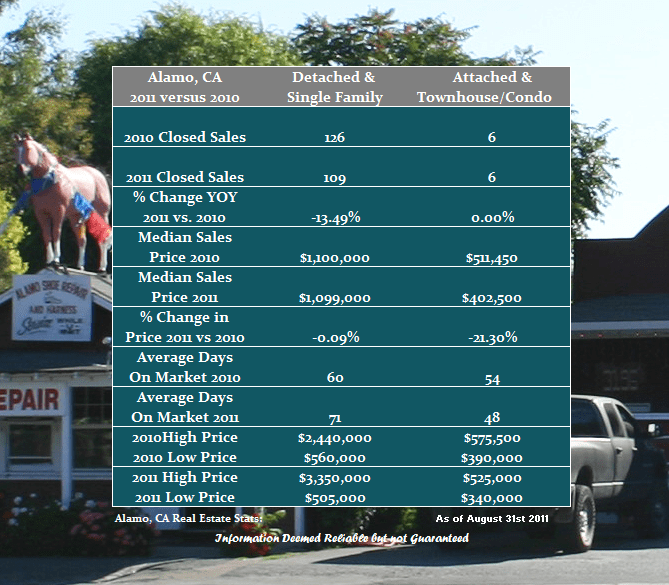 Share the post "Alamo Real Estate Market Year Over Year Report through August"